What good is Twitter, anyway? And why should you use it? Inspired by the defense of academic blogging offered in this space last month by Ken Owen, I want to offer a few thoughts on using Twitter as a professional historian. Over the past few months, I’ve had several discussions, both in-person and online, in which I’ve been called on to defend Twitter (it seems that others see me as either an effective or at least irrepressible user). After over three years on the service (@jmadelman, if you’re curious), I’ve certainly developed a theory of Twitter for myself. I would not offer it as universal, but I do think it’s important to highlight what’s good about it, and perhaps one or two things that I don’t like. First of all, Twitter is a really useful way to keep up with what’s going on in the academic world. The most important thing it does for me is allow me to keep track of who’s discussing major issues not only in my field(s), but also in the humanities, digital humanities, and the academy. I still use Google Reader (though like everybody else I’m switching), but some of the most interesting things I’ve found online come through Twitter. It acts, as many have noted before me, as a filter. I’ve also found it enormously useful to discuss both research and teaching. Sometimes that takes a serious turn, as when I was developing a syllabus on Native American history for this semester. I was able through the historians’ community there to develop several useful leads, particularly in Latin American native history, where my prior reading was less thorough. Would I have assigned Caroline Dodds Pennock’s (@carolinepennock) article on gender and space in the Aztec city if I didn’t follow her on Twitter? Almost certainly not, but I’m glad I did. I’ve also been able to track down research leads, and of course to do exactly the same for others. It’s not an exclusive source, of course, and I wouldn’t suggest you use it without any other source of enrichment. We all still have colleagues, mentors, and friends who can also provide opportunities for conversation about research, pedagogy, and other professional matters. For more on this topic, Kathleen Fitzpatrick (@kfitz), the MLA’s Director of Scholarly Communications, has shared a talk she gave on “Networking the Field” at this past year’s MLA conference. Sometimes, of course, it’s just nice to have Twitter on in the background as I work. It’s one more way to have some company while working, to share silly stories about life, the occasional comments about putting together a lesson plan or a paper, and so on. On the other hand, I like to think of myself as relatively clear on some of the drawbacks of Twitter. First of all, it takes time. We all get exactly 168 hours a week, unless you’ve figured out some sort of wormhole thing that you haven’t shared with the rest of us. Time on Twitter is time you are not doing something else. And yes, it’s not the place for nuance—at least once a month I end up in a conversation that goes off in a silly/bad direction because it’s hard to get one’s point across in a sophisticated way in 140 characters. It has also in the past year or so (at least on my feed) seemed to become a bit more of a closed loop. That is, it’s become a bit harder to my mind to offer unorthodox opinions. I still find it an enormously useful service, but lately I’ve found it somewhat less welcoming. I don’t think it reflects well on the humanities, nor does it bode well for the possibilities of the service. But that may be a topic for another post. The service can also very quickly devolve into a proverbial fire hose. At this point I follow nearly 600 people, which is not an effective way to see conversations or keep track of my closest friends (or “Twitter friends”). For that purpose the list function is indispensable—I keep one for historians, one for people in journalism and media, one each for various institutions I’ve been associated with. I don’t read all of them regularly, but if I’m curious about what’s going on in Boston, say, I have a place to go. Even so, at times it’s a bit much. You’d be surprised how many historians lose sight of the fact that Twitter is a platform, and quickly launch themselves into arguments that rely on technological determinism, one way or the other. One of the primary reasons I joined was because as a media historian, I’m interested in learning about processes of historical change occasioned by what I would casually describe as ruptures in media technology. It’s just technology, though. People use it in many different ways, to different ends. Yes, some people tweet about what they eat for breakfast (though our own @Raherrmann has somehow managed to turn that into a lucrative research topic). If there’s anything about the debates over Twitter that bother me, it’s the sense that Twitter itself has magical powers to turn everyone into free-communicating network nodes or, conversely, into idiots. Or, to put it more succinctly, Twitter lacks agency. By way of conclusion, I want to be clear that I don’t think you need to join Twitter. It takes time to master, both on a day-to-day basis of keeping up with feeds (though you can decide how much to do that), and over the long-term as you develop a network and cultivate a set of followers and lists that allow you to customize the experience. But I do think you’ll find it useful. If you’re curious about Twitter but have never used it, do take a look at the “10 Commandments of Twitter for Academics” offered by Katrina Gulliver (@katrinagulliver) last year in the Chronicle. She provides some helpful hints on how to get started, how to use hashtags (including the ever-popular #twitterstorians), and other advice. If you’re interested in more of a how-to guide (with commentary on the benefits of Twitter, Liz Covart has published a three-part series (Part 1, Part 2, Part 3) on the academic use of Twitter. 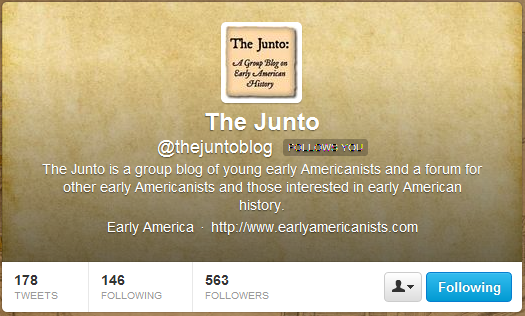 And, of course, you can follow the blog @thejuntoblog on Twitter, and check out our list of Junto tweeters. One of the difficulties I have with Twitter is that I like to see *everything* that comes across my feed. I can’t handle the thought of just skipping what people said while I wasn’t online, so I go back and read through. I couldn’t do that if I was following more than the 200 or so people I currently follow. But I get the feeling other people’s reading strategy is very different – they just dip in and out. Perhaps there’s a very wide array of reading strategies (just as there are for books and newspapers), but I need to think more about what that means for getting the best use out of Twitter. The way people post the same thing over and over again, or with an “ICYMI” tag, is a really bad solution to that problem, which I find really annoying. One of the best things about Twitter is its ostentatiously public nature. People are far less likely to use it just to post pictures of what they had for breakfast because it’s not built on the concept of friendship; it’s built on the concept of surveillance. You don’t “friend” people; you “follow” them. (Creator Jack Dorsey was inspired by city infrastructure, especially emergency dispatch systems.) So people tend to use Twitter in a more public way than other social media services, conceiving themselves as taking part (or trying to take part) in a giant conversation. The people who seem to take to Twitter best are not the same people who most enthusiastically embraced Facebook. In fact, I have a lot of young, early-adopting friends who have tried Twitter and can’t figure out what to do with it. Twitter is most useful to people who belong to public “communities” (professions, book tours, political movements, etc. — not friendship groups) that are separated by distance. Thanks to both of you, Tom and Jonathan, for your comments. I think you both point in a direction that I was trying to go in the post: Twitter is simple to start, but difficult to master; plus, mastery can mean many different things. One person’s desire (limit followers to 200 so you can actually keep track of your entire feed, per Tom) is another person’s limitation. For myself, I’ve set 600 as an arbitrary limit, but I’m already not able to track anything in the main timeline. I mostly read in lists, and do try to limit the number of times during the day I read. At some point I gave up on reading everything. (Not to mention the weekends I’m away from the computer … that’s just hopeless). And I agree, Jonathan, that the publicness of Twitter is comforting in a way. It’s something that drew me to the service, frankly. Because everything was public (unlike Facebook, with its byzantine privacy settings), I always assume that anyone can read what I write. The transparency was both refreshing and liberating. Thanks for this post, Joe. I finally set up a Twitter account this week so I could follow some of the museums, organizations, and news sources I like as it seems like Google reader, and possibly blog aggregators in general, are going to fade into the sunset. One thing I’d like to put out here that I know is controversial, but I think still a discussion that needs to happen–I dont think people should tweet conference papers without notifying the speaker first. Several reasons for this. First, conferences are usually closed events and only other people you can see in the room are the intended audience. I see conferences as a place to test out ideas, not broadcast them to a national audience. The speaker should have the option to keep a paper within the confines of the room, or at least should be made aware that his or her ideas will be reaching a broader audience (I realize people discuss papers far behind the confines of a room, as they should, but Twitter is an instant delivery to hundreds if not thousands of people). Second, people who closely tweet an entire paper could very easily be transposing the arguments incorrectly–as a speaker, I’d at least like to know who is tweeting something so I can make sure the ideas posted are accurate. A detailed tweeting of somebody’s paper amounts to a form of publishing in my mind. Finally, I’ve had people sitting right in front of me or even at the presenter’s table tweeting furiously as I spoke, and it felt a bit like having a conversation with somebody who is texting. A speaker can take cues on how the talk is going and whether the audience is following him or her by reading faces, and the more people staring at their phones or ipads, the harder that is to do. I swear, I am not a luddite! I worked in new media for several years and I think tweeting from conferences does have its uses. In many cases speakers do want their ideas to be tossed to a larger forum, and twitter can be a good way to do that–if the speaker knows it’s happening and can follow it! I just think there needs to be a protocol or etiquette for letting speakers have a say over whether their talks are tweeted or at least know the talk is being tweeted. Cassie, thanks for your comments. I think using Twitter as a “substitute” blog aggregator is a good idea. Aside from the five or six blogs I read regularly out of habit, I find the most interesting reads through my Twitter feed. I didn’t say anything on that topic in the post, but in my opinion, I love that people live-tweet conferences I can’t attend, but hate doing it myself when I’m at sessions. That is, when I’m not in attendance, it’s a great way to be able to keep up with scholarship, see what people are talking about, and so on. But I’ve avoided doing it myself except in very limited circumstances (the AHA panel on digital history and Twitter among them) because I find it distracts me from the session. And then you add what is still a grey area in terms of the ethics of publicity for Twitter and conferences, as you point out. I don’t think it should be strictly forbidden, but I do think we need (and that AHA and other organizations will eventually come up with) a set of standards for the practice to make it work for everyone.